Finishing Brass Natural, Tinned, Nickel Plated etc. ISO Metric, BSW, BA, BSF, UNC, UNF UNEF etc. 1/8", 5/32", 3/16", 1/4", 5/16", 3/8", 1/2", 5/8", 3/4", 1", 11/8", 11/4", 11/2", 13/4", 2". 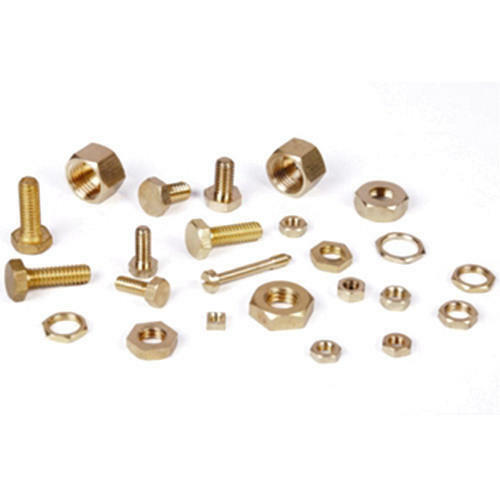 Square Nuts Panel, Nuts Welding & Nuts Weld Brass Nuts Cold Forged And Bar Turned Fasteners. We “Swati Enterprise” are a Sole Proprietorship firm engaged in Manufacturer of Aluminium, Brass and copper alloy components. Since our establishment in 1992 at Jamnagar (Gujarat, India), we have been able to meet customer’s varied needs by providing products that are widely appreciated for their sturdy design, rust resistant nature and high strength. Under the strict direction of our mentor, “Mr.Dilip Mungra", we have achieved an alleged name in the industry. Swati Enterprise has successfully finished at decade of remarkable track records in providing all its esteemed customers with state of the art qualitative services at very fair prices with almost precision in manufacturing of the products in all respects, right for the quality control to end user satisfaction. It is committed to cater all the needs of the customers in terms of various configurations. We have best of expertise and experience in this field. We also offer custom manufacturing of Brass Products based on Drawing and Specifications. We are very particular in quality of all our operations and procedures, ranging from quotation to final billing and customer information updation. Our motto is to provide maximum satisfaction to our customer through supply of quality products at the time and place as required by the customer.